This Homa invokes the blessings of the divine couple – Krishna and Radha, who are known for their eternal love and affection. The kind of love amongst them is often described as the purest form of devotion and an ideal for male and female love. 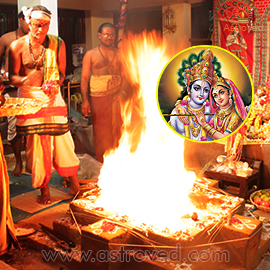 Performing a sacred fire prayer for the divine duo can bless you with loving and affectionate relationships and solve relationship problems.